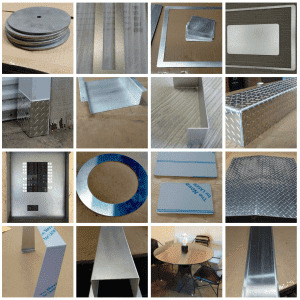 MetalsCut4U will always support your DIY project as long as we believe to fulfill your high expectations. You can configure online 14 different geometrical shapes by answering 4 easy questions. Those shapes are rectangle, circle, triangle, divided circle. We even offer you to configure a bend piece of sheet metal like an angle or a corner guard, a z-channel or a u-channel and some others more. Sometimes these shapes are just not enough. 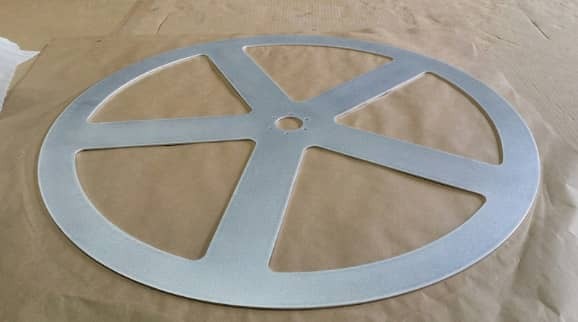 In that case that the usual rectangle, angle, triangle, circle and so on is not enough, even if you need a unique hole within that piece of sheet metal you can contact us write here. Send us your drawing by email or use the upload functionality of our Individual Contact Page and send us that drawing of yours. Now it does not have to be done with a CAD program it is enough when you draw it by hand. But we must insist on being able to identify what you want and how big it should be. So please add all relevant measurements and specifications you think are necessary to describe the sheet metal part you want us to fabricate for you. In the case of the above shown aluminum circle with the cut-outs we received a drawing. Based on the drawing we where able to calculate a price for one unit. Often we do not know for which purpose our customers are seeking our help in cutting, bending and sometimes even welding a unique metal part for them. But we sure would like to know. So send us your pictures after you have installed the metal part we have fabricated for you individually. Thank you. After you have agreed to the price it pretty much goes it's ways internally. We start the CAD and laser programming so everything will be as you have planned it. Then we cut it, bend it and or weld it, just as the finished metal item requires it. Usually it takes us 15 business days to get it done. But sometimes if the project is more complicated and involves more fabrication steps then a simple cut out it can take longer.